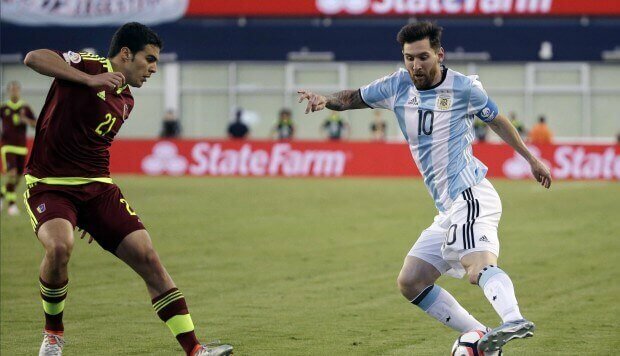 Argentina vs Venezuela: The live streaming will be provided by beIN Sports Connect and fubo.tv. While the broadcast will be live and done by beIN Sports on television. Today is another football match in the FIFA World Cup 2018 qualifiers stage. The hopes of both the teams are still hanging in balance. The CONMOBOL qualification will see Argentina welcoming Venezuela on Tuesday. As of now, Lionel Messi and company are ranked #5 in the hexagonal. They need the fourth place at the very least to qualify and book a seat for Russia, next year. Due to lack of motivation, they have won only six matches in the qualifications round so far. They have an array of world-class football players. On the other hand, Venezuela lies at the bottom of the group. On papers, it looks somewhat easy game for Argentina at El Monumental, Buenos Aires. The Barcelona forward, Messi has been a piece of dissatisfaction as he has been able to drive his nation towards better days. Argentina wasn’t able to do even a single goal against Uruguay and the match ended in a draw. It cost them to be placed fifth in the group table. They are followed by Peru, Paraguay, and Ecuador within 3 points. If Messi’s team win and results fall into their lap, they could jump to number two. Playing in front of the home crowd could result positive. Only three more qualification games are remaining. Thus, coach Jorge Sampaoli has left with a very amount of time to correct any misfits or issues if he has identified. The manager has been putting his faith in the attack, but the team hasn’t been able to perform something outstanding. Watch: Mexico vs Costa Rica. Messi and mates have averaged just a goal a match this time so far. Argentina should grab the opportunity to defeat Venezuela and grab three points. So far, Venezuela has won just a single game out of 15. It shows their lack of quality. Messi will be sharing the stage with Paolo Dybala. In the last session, Dybala scored 11 goals in Serie A. And he has already scored four this season. Argentina can do anything, but they should prove to their supporters today that they want to go and play World Cup in Russia. ARG should win considering their opposition and quality. Messi’s career has been a mixed affair. Sampaoli’s firepower should do something. So far, Venezuela has conceded 34 goals in qualification. If Messi gets his form back, the three goals will be sure and in their basket. The World Cup can’t happen without Argentina and Messi.